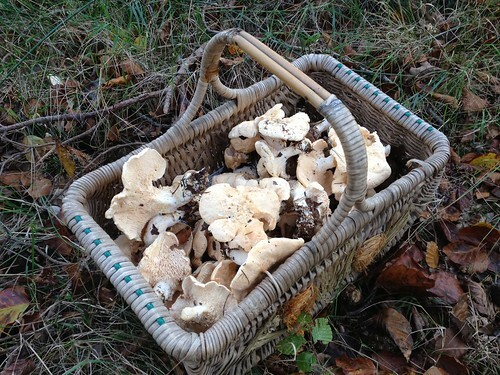 Autumn is the season for mushrooming and my all time favourite mushroom is the wood hedghog mushroom. This year has been terrible for mushrooms. Contrary to popular opinion, mushrooms do not like rain. They do like a little dampness and a heavy morning dew is ideal. They like cold crisp mornings with an autumn feel to the air. What they don’t like is the weather we’ve had this year. The months of cold and rain has not only been bad for veg and cerial crops, but it has also taken it’s toll on the mycelium, the ‘roots’ of the mushroom, a network of fibres which spread underground for sometimes acres. The flooded, compacted ground in the spring and summer has probably killed off much of the mycelium. This followed by the warm autumn has stopped the mushrooms from appearing. Anyway, on a brighter note, the weather has changed and is now much more seasonal and finally (if not a little fashionably late), the mushrooms have started to appear. As the frosts are on their way, there is only a small window when many fungi including the hedgehog will be around so I went with my mum, dad and sister to a little place in the New Forest where the hedgehogs grow aplenty. It’s a half hour drive and a 20 minute walk but it was worth it. Between us, we gathered around 2lb of hedgehogs, leaving plenty behind to spore and for a possible revisit. All in all a successful trip and we came home with some yummy hedgehogs to fry up.